Designing book jackets requires a certain amount of humility and acceptance that your work will be enjoyed without most people acknowledging the time and effort you put into it, or ever associating the book with your name. On the other hand who else is there who can boast of having collaborated with the likes of Kafka, Dostoevsky and Stieg Larsson? 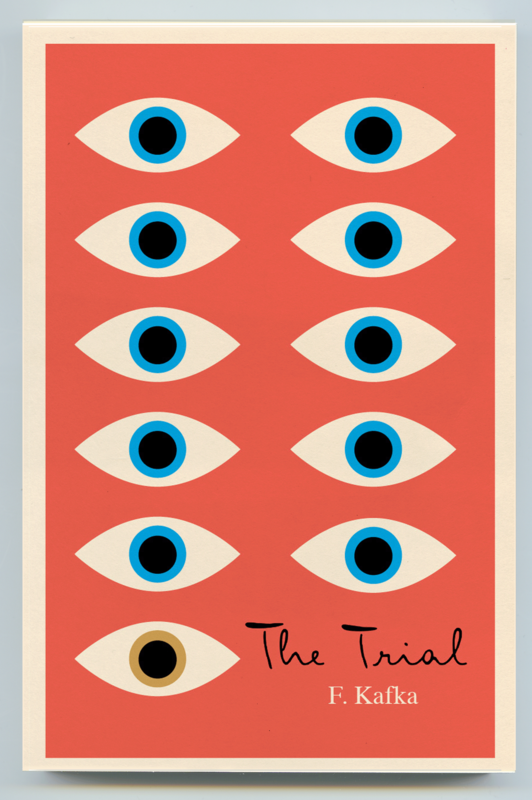 Book jacket designer at Knopf publishing Peter Mendelsund has done precisely that and more. 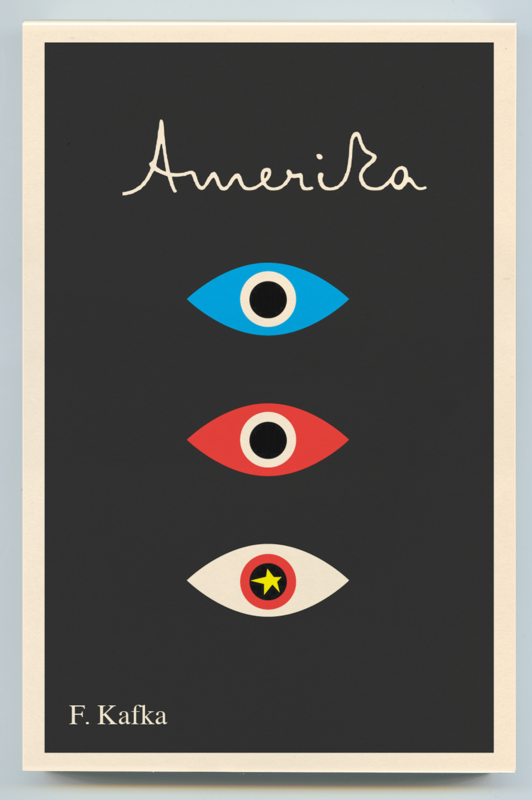 With his radical reinterpretations of Kafka covers for a new Schocken edition of the Prague-born writer’s works to begin coming out in June, Mendelsund delved deeper into his interest in Czech writers, composers and book cover designers as well as the stylistic similarities between Socialist realism and Hollywood publicity. literalab: Besides Kafka, what other Czech and Central European writers have you designed jackets for – and which writers would you most like to design? Peter Mendelsund: Kafka is the only Czech author I’ve ever done a jacket for – which is sad. I’d love to work on Hrabel, Hašek (Jaroslav, but, hey, if Dominik Hašek has written a book, I’d work on that as well), Havel (Knopf has actually published books of his, but I haven’t had the honor of working on any of them). It would be great fun to redesign the Kundera backlist – although I gather Kundera is pretty “hands on” in the jacketing department, which is, practically speaking, always bad news for a designer. Some of his American covers are actually credited to him personally. And they aren’t half bad— but, still. In general, I find myself drawn to novelists who are as much philosophers as storytellers. Kundera fits that mold perfectly, as do many Czech novelists Oh, and Vaculík! I have a guinea pig of my own. His name is Dwayne (note: One of Ludvík Vaculík’s novels is called The Guinea Pigs). As a recovering Classical pianist, I also have a passion for Czech music, and would love someday to have the opportunity to design something, anything, for Viktor Ullman (Der Kaiser Von Atlantis is, oddly, on my list of favorite operas), Janáček, Martinů, and definitely Ervin Schulhoff – number one neglected composer of the twentieth century. The Mitteleuropeans are definitely missing from my portfolio. This needs to change. literalab: If you’re designing a cover for a writer from, for example, Germany or Japan, do you take into account the art and design from his/her native country, do you purposefully avoid it, or something in between? Mendelsund: Well, I definitely take into account the author’s native culture, though whether I choose to adopt something stylistic from this culture depends on the vagaries of the particular project. There are times when one wants to accentuate the universal aspects of a writer’s work; and there are times when one wants to situate an author in a specific time and place. Often, the pertinent question will be: is an author known in America (to the reading audience I’m selling to) as a citizen of a particular culture, or is his/her ethnicity or country of origin ancillary? With Kafka, I would argue that his greatness lies in the universality of his ideas, that his writing transcends time and place. Isn’t all great writing universal, almost tautologically? I’ve noticed that early in a great writer’s career, he/she will be thought of as a, for instance, “South American writer,” or as a “Chinese author”—and as time passes and as reputations, if they are deserved, grow, these authors slowly morph into citizens of the world and become, simply – writers. Conversely, with many other writers, nationality is at the core of their work – their great subject is place and contextual identity. They may write about Czech-ness, or English-ness, etc. These are the books where it makes the most sense to bring the local artistic tropes and visual cues to bear. For what it’s worth, I love delving into the visual vocabulary of different cultures. literalab: Your cover for Doctor Zhivago seems like a radical departure from the majority of (terrible) jackets for the novel I’ve seen – without anything Russian or epic – What was your thinking behind it? Mendelsund: Americans, for better or for worse (definitely for worse), tend to associate the book with the David Lean film, and more specifically, associate the book with Julie Christie and Omar Sharif. It seemed, cynically, like the best way to sell the thing was to subtly reference the matinee idol aspects of the movie without giving it a strictly Hollywood treatment. In other words, it had to look big, and character driven (rather than the usual “kulaks in the snow” kind of deal.) It sounds idiotic, but – the book had to look like the visual equivalent of Lara’s Theme (note: the well-known “leitmotif” written by Maurice Jarre for the film). The main illustration is from a Soviet propaganda poster that was deployed in the implementation of the five-year plan— and it is, oddly, very filmic. I suppose selling a film is in some ways like selling a monumental, and ultimately catastrophic agrarian reform. In fact, the similarities between Soviet Socialist realist propaganda and Hollywood publicity probably constitute the subject of someone’s doctoral dissertation somewhere. If it doesn’t, it should. literalab: Book design has a long history in the Czech Republic. What is it you like about the Czech style of design (if there is a Czech or Czechoslovak style) and what do you feel you can take from it in your own work? Mendelsund: The Czech book design I love most – Čapek, Truhlař, Sutnar – straddles the boundary between serious abstraction and cartoonish whimsy. There is a formal beauty married to an irreverence I can’t but think of as culturally “Czech.” In my mind, the Czech design sensibility is the visual correlate of the Czech literature I love – serious whilst funny, philosophical whilst absurd. I’m thinking of the way Kundera can seamlessly, within a single page, and with a consistency of tone, go from parsing Nietzsche to describing some banality of modern life, or the way Kafka will describe the human condition through absurdities like the Ungeziefer (note: the insect, beetle in The Metamorphosis). Great Czech design uses broad strokes in order to represent great complexities. This is how I myself would like to design.